Auto-detect option to detect location of DBX files in system. Multiple styles to preview mails and attachments of DBX files. Folder structure preserved while conversion to PST format. Availability of Split PST option to split large output PST files. 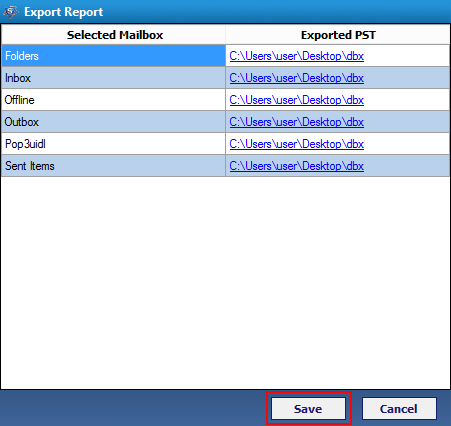 Export Outlook Express to Outlook 2016, 2013, 2010, 2007. Installation of Outlook Express not necessary for DBX file conversion. MS Outlook installation not necessary to convert DBX Files to PST file format. The software allows conversion of multiple DBX files at once. The DBX files can be added individually or they can be stored in a single folder and the complete folder can be added for conversion. The software gives an option to auto detect the location of the DBX in case you are not aware of its location. Enabling the Auto-detect option activates the software to search the DBX file automatically. With Best DBX Converter, multiple DBX files can be converted to varied formats like such as convert DBX to MBOX, EML and MSG, PST. The software creates a single PST file for each default folder of DBX file. The Outlook Express to Windows Live Mail imports DBX files in both EML and MSG formats. 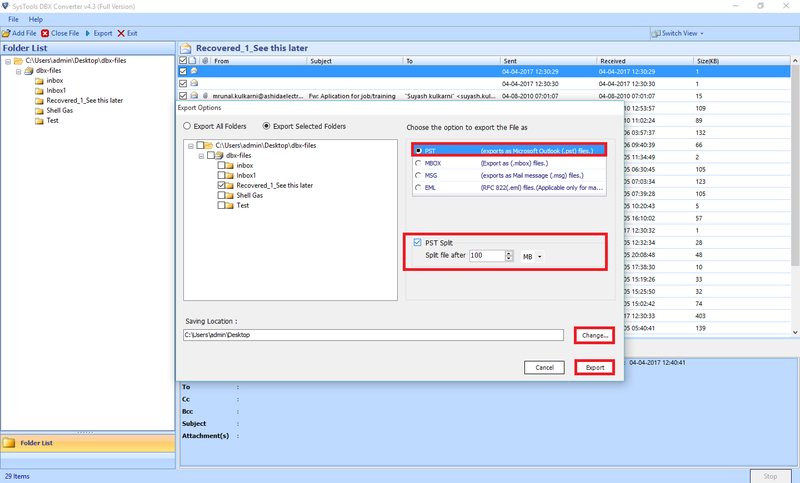 For each email stored in the DBX file, a separate EML and MSG file is created. 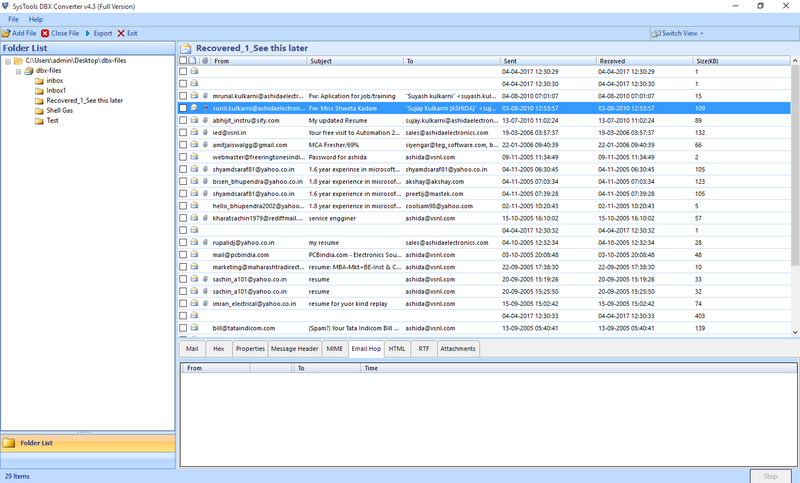 If there are 100 mails in DBX file, 100 EML and MSG files will be created. DBX to PST Converter offers the facility to view the emails and attachments in scanned DBX file in multiple views. The different views available by default are Normal mail view, Hex view, Properties view, Message header view, etc. The software is equipped with Split feature that splits the output data files into smaller ones. If the DBX files after conversion to PST files are large in size, the split features divides it into small sized PST files. Naming conventions option in DBX to EML converter software allows naming the output EML and MSG files according to different naming conventions. This option helps to manage the large number of EML and MSG files. The Outlook Express DBX to EML gives the facility to export selective folders and emails from the DBX file to PST, EML, MBOX and MSG formats. The original formatting of the emails will be maintained after they are converted to different formats. 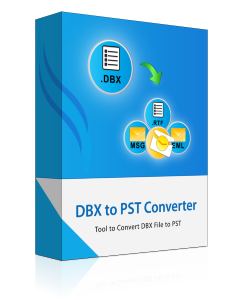 The Free DBX to PST Converter tool preview PST Emails & Export 25 items to , MBOX file formats. Support: Windows 10 & all below versions of Windows. Disk Space: 50 MB of free disk space. Is there a size limitation on the number of DBX files that can be converted? No, the software poses no limit on the number of DBX files and a user can convert unlimited DBX files to PST, EML, MBOX & MSG formats. Can I import Outlook Express DBX Files into Outlook 2016? Yes, You can easily import dbx files into Outlook version 2016, 2013, 2010, 2007 after the conversion of dbx files using the dbx converter wizard. Does Outlook installation is necessary to change dbx files into pst? No, Outlook installation is not necessary to extract dbx to pst file format. What is the best way to convert dbx to pst? Use of DBX Converter Wizard tool is the best and recommended solution to easily migrate dbx files to Outlook PST. Can I Migrate From Outlook Express to Thunderbird using the tool? Yes, you can easily Import Outlook Express DBX files into Thunderbird file format. But for this, you will have to convert dbx files to mbox file format and then use import wizard of Thunderbird to import mbox files into it. Will the DBX Converter prove useful in convert Outlook Express to Windows Live Mail? The best free DBX to EML Converter Software helps you to easily migrate from Outlook Express to Windows Live Mail. Will the software create a single PST file for a single DBX file? Yes the software provides the best way to convert dbx to pst and creates individual PST files for each mail folder of DBX file. For instance inbox.pst, sent items.pst, drafts.pst, etc. files will be created. How to Import Outlook Express to Outlook 2016? 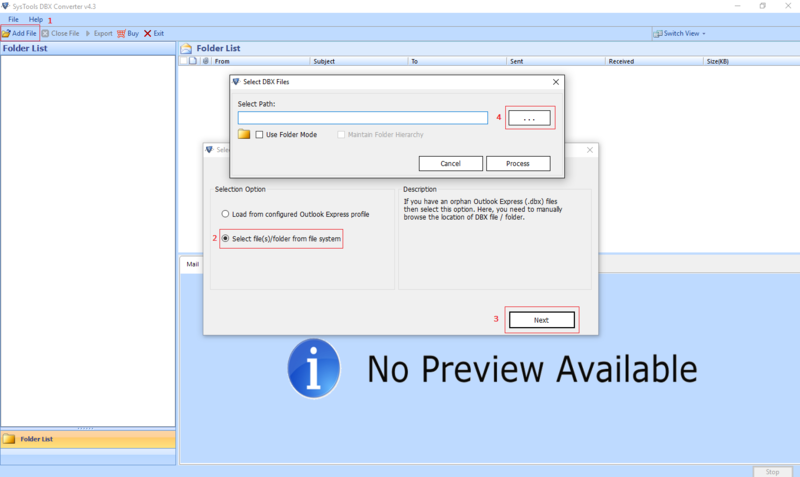 Click on export for final conversion of dbx files to Outlook pst. I used DBX to PST Converter software to easily access Outlook Express DBX files into Outlook 2016. The software provides me golden opportunity to convert DBX files to Outlook PST without loss of any data. I previewed my DBX file data with attachments in advanced preview mode provided by the software. I would like to suggest software to my colleges and friend as well for simple and easy conversion of Outlook Express DBX files to Outlook PST. Thanks for such nice software. DBX Converter performs the process of conversion of Outlook Express DBX files fantastically. I am satisfied and happy with performance of DBX Export software. I easily convert my DBX files to EML file format. The software provides me option to save DBX files via multiple naming convention. I easily manage my dbx file data after conversion. Very thankful to this software. No matter how hard you search, no other solution will work as effectively as dbx to pst file Converter. I successfully converted all my DBX files to Outlook PST format without any issue. It is the most efficient solution promising optimum results.